ochs und junior was founded in 2006 by two veterans of the Swiss watch industry: Ludwig Oechslin and Beat Weinmann. Weinmann worked for 16 years as managing director of Embassy, one of Europe’s leading watch retailers, while Oechslin designed some of Ulysse Nardin’s most awarded watches (including the Freak and Trilogy of Time). In 2012, Cail Pearce joined ochs und junior to lead its internet and communications efforts, after working 7 years for Google, Inc. in California. The board of directors for ochs und junior includes the CEO and COO of Ulysse Nardin. Ludwig Oechslin is responsible for all of ochs und junior’s technical innovations and functional designs. For over 20 years he created for Ulysse Nardin award-winning watches including the Freak, Moonstruck, Trilogy of Time, Perpetual GMT, and Sonata. 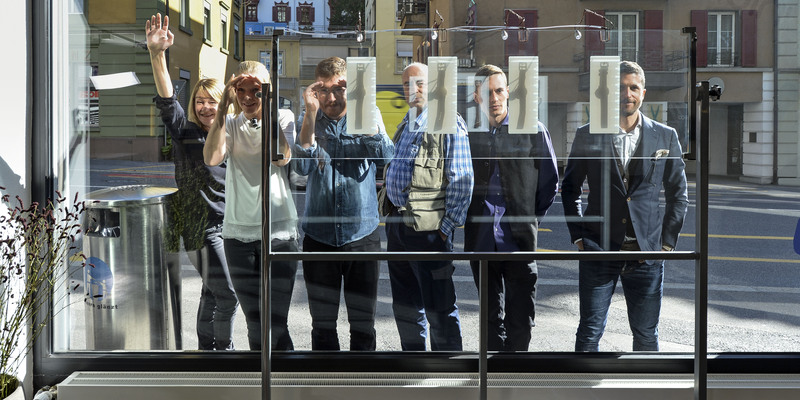 From 2001 to February 2014, Oechslin curated and managed the most important museum dedicated to the history of watch and clock making, the Musée International d’Horlogerie (MIH) in La Chaux-de-Fonds, Switzerland. As a Doctor of Theoretical Physics (University of Bern) and qualified mathematician, astronomer and archaeologist, he uses his extensive learning and experience to create innovative wristwatches that excel in one area for which, to date, Swiss watchmaking is not known: simplification. Complications in mechanical wristwatches such as calendars conventionally incorporate levers and springs. Oechslin’s studies of astronomical devices, and his restoration and documentation of the Farnese astronomical clock in the Vatican between 1978 and 1982, taught him that gears are a better solution for a wristwatch; he now bases his designs on that insight. His novel combinations of cogwheels and epicyclic (planetary) gearing are so straightforward that they can be manufactured by any competent engineering workshop, and offer excellent operational reliability. More information is available about Oechslin here. Beat Weinmann is cofounder and CEO of ochs und junior. Weinmann served 16 years on the management board of Lucerne-based watch and luxury goods retailer, Embassy. Access to one of the largest selections of exclusive brands sharpened his discernment and, with his critical faculties, made him an acknowledged expert in the Swiss watch industry. Ludwig Oechslin and Weinmann are long-standing friends, and their first venture together was the creation of the MIH watch. As ochs und junior’s CEO, Weinmann represents the interface between production, planning, communication, sales and service. Weinmann focuses on direct communication with the customer. In addition to serving as the head of production, he provides the customer with expert advice on his or her choice of a perfect watch – and ensures visitors to ochs und junior’s center of operations in Lucerne receive a warm welcome. Weinmann is also responsible for all after-sales service and works to ensure customers’ timepieces are returned in 10 days – far faster than normal in the luxury watch industry. A resident of the Lucerne area for 18 years, Weinmann serves on the committee of the Museum of Art Lucerne, which is housed in a building designed by Jean Nouvel. It is Weinmann’s pleasure to offer local tips for anything customers might like to do upon their visit to Lucerne. Cail Pearce is responsible for ochs und junior’s communications and website, which was recognized as one of the best in the industry. A graduate of Stanford University, Cail worked at Google for over seven years, the last two as a user experience researcher on Google+ Hangouts and Google Books. Cail is the lead inventor on a US patent for “Dynamic recommendations based on user actions”. During his honeymoon in Switzerland, Cail became acquainted with Beat and the watchmaking concepts of Ludwig Oechslin. Seeing the MIH watch on this trip made him realize that he wanted to switch careers to work in the watch industry. Cail lives in Lucerne with his wife, BinBin. Watchmakers Kevin Hoffmann and Sandra Flück assemble, regulate and repair ochs und junior watches at the ochs und junior workshop in Lucerne. They also serve as Ludwig Oechslin’s technical assistants. Isabelle Ruckstuhl is responsible for administration at ochs und junior. ochs und junior’s board of directors is stocked with talent and industry expertise. Patrick Pruniaux (CEO of Ulysse Nardin), Lucas Humair (Industrial Director for Ulysse Nardin), Kornelia Imesch Oechslin (Professor of Modern and Contemporary Art and Architecture at the University of Lausanne), Hans Erb (longtime watch industry expert), and Rolf Kästli (lawyer) make up the ochs und junior board.